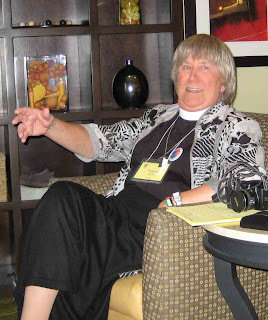 For me being Transgendered and in ministry is a baptismal thing. We are all by reason of our baptisms ministers. And as baptized Christians no aspect or order of ministry should be closed to us by reason of who we are. By Baptism we die to old untruths and are born again to a new truth in Christ. So it is, too, with the Transgender Transition which I found a very similar spiritual process. Indeed, throughout that process, I was haunted by that old baptismal hymn: "Take me, take me as I am. Summon out who I will be." Tonight that's all I ask. Take me as I am; as an individual. In this regard, I recall with thanksgiving the treatment as an individual I received in the ordination process from Bishop Bill Swing, who when confronted by hostile objections to is ordination of gays and lesbians and others, said " We don't ordain groups of people. We ordain individuals." Again what I ask is that I be treated as an individual. In return I offer the integrity of my truth.